What is Avaima Time & Attendance? Avaima Time & Attendance is a time and attendance tracking and management solution designed to help businesses and organizations record, monitor, and manage time and attendance of their employees. It simplifies all processes and tasks related to time and attendance management. On top of that, it is a user-friendly platform that can be utilized right off the bat without any extensive training. Avaima Time and Attendance does not require additional hardware for it to run. It also does not limit the numbers of employees the management want to monitor. Avaima Time and Attendance is a very basic time and attendance management software that records clock-in and clock-out time, as well as incidences of over-time and under-time. The software also generates comprehensive statistics to provide users with data and insights to help them improve employee attendance, productivity, and overall efficiency in the workplace. Avaima Time and Attendance is a perfect solution if you are looking for a basic time tracking and attendance management tool to monitor time and attendance of your employees. It is capable of record working hours of your employees, including both over-time and under-time. It also makes it easy to see which employees have met their quota of time, track their absences, and record specific clock-in and clock-out data of certain employees. With Avaima Time and Attendance, enforcing punctuality and empowering your employees to be efficient and productive during working hours is a breeze. You see who comes late, who comes early and evaluate their performances by viewing their statistics, which can be used for promotions, demotions, encouragement, as well as the basis for termination if it comes to that. The software helps calculate the working hours your employees should have spent and it will stack the data against the actual time they spend. You can set the data and comparison on a weekly, monthly, and yearly basis and see how much time your employees have worked as opposed to the actual number hours they gave the company. 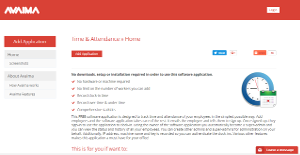 Avaima Time and Attendance is continuously developed and improved upon by its makers and you can also help with the development process by sharing your suggestions on what features you want to be added to the software. What Problems Will Avaima Time & Attendance Solve? Avaima Time and Attendance lets you monitor the Clock-In/Out time of employees in your office effectively. Avaima Time and Attendance informs you who (in your office) is absent and when. Avaima Time and Attendance helps determine who comes late and how frequently. Avaima Time and Attendance allows you to record over-time of each one of your employees. Avaima Time and Attendance lets you record under-time of each one of your employees. If you are interested in Avaima Time & Attendance it can also be useful to evaluate other software categories of employee monitoring software collected in our database of B2B programs reviews. Since each company has specific business requirements, it is sensible for them to desist from seeking a one-size-fits-all faultless software system. Needless to say, it would be useless to try to find such an app even among widely used software platforms. The smart thing to do would be to jot down the various vital factors that need consideration such as required features, finances, skill levels of staff members, company size etc. Then, you should do your research thoroughly. Read some Avaima Time & Attendance reviews and investigate each of the other apps in your shortlist in detail. Such exhaustive research can ensure you weed out ill-fitting systems and zero in on the system that presents all the aspects you need for business success. How Much Does Avaima Time & Attendance Cost? We realize that when you make a decision to buy Employee Monitoring Software it’s important not only to see how experts evaluate it in their reviews, but also to find out if the real people and companies that buy it are actually satisfied with the product. That’s why we’ve created our behavior-based Customer Satisfaction Algorithm™ that gathers customer reviews, comments and Avaima Time & Attendance reviews across a wide range of social media sites. The data is then presented in an easy to digest form showing how many people had positive and negative experience with Avaima Time & Attendance. With that information at hand you should be equipped to make an informed buying decision that you won’t regret. What are Avaima Time & Attendance pricing details? What integrations are available for Avaima Time & Attendance? Pros: It is really a good product, it works really great. Cons: Sometimes it does not allow to add overtime after midnight. In mobile browser it will not auto clock in while screen is lock. Pros: As the CEO of a small digital agency I have found AVAIMA time and attendance to be very useful to monitor employee efficiency, productivity and under time. This simple yet effective software serves as a valuable tool @ Stubborn Solutions to carry out P/L calculations and has reduced the accountancy costs as well. I have been using Avaima's other solutions as well for almost a year. Great work highly recommends it. The application is very user-friendly and it offers almost every feature that a small company needs. It is really a good product, it works really great.